Ca’ del Baio was our third visit in Barbaresco, on David Way’s recommendation. Based near Treiso in the Southern part of Barbaresco, this winery is owned by the Grasso family and is now mainly run by 3 sisters, Paola, Valentina and Federica who have gradually taken over from their parents. What is particularly remarkable about Ca’ del Baio is that, within their 25Ha of vineyards, they own a large, 2.5Ha out of around 14Ha of the famous Asili cru near Barbaresco, that abuts Marchesi di Gresy’s Martinenga monopole. Ca’ del Baio consider their wines in a pyramid of quality. As their estate’s mainstay, Asili is their jewel-in-the-crown, sitting atop their pyramid and sometimes made as a Riserva. A trio of other Barbaresco wines sits beneath that: cru Pora, cru Vallegrande and their new, multi-cru blend of Autinbej, launched with the difficult 2014 vintage. 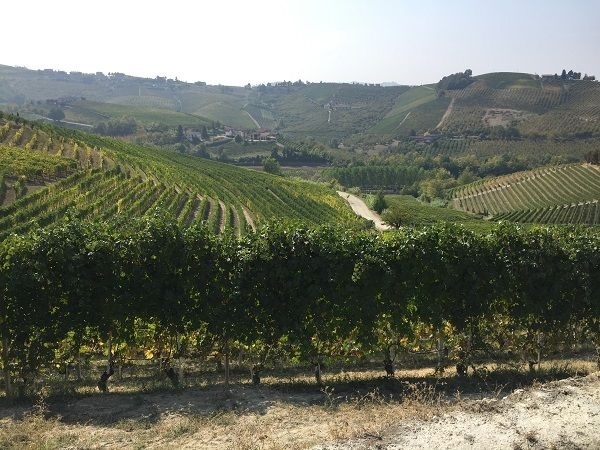 At the base of their pyramid are their Langhe Nebbiolos which they see as being entry-level wines for learning to appreciate Nebbiolo – the grape which makes up 70% of their plantings and is the clear focus for the business. Nevertheless, as is usual, Barbera and Dolcetto reds are made, as is a Moscato d’Asti. Chardonnay and Riesling round-out their white portfolio. When we visited, being taken through a tasting by Paola and Valentina, harvest was literally being completed – the harvest team came in with big smiles on their faces, to sit down for some well-earned glasses of wine, cheese and charcuterie. Given this event, for some reason I can’t explain – having too much fun I guess – we didn’t take any photos at all, so I’ve borrowed Ca’ del Baio’s own downloadable press image to enliven this profile a little bit. With the harvest team came Roero winemaker, Carlo Deltetto of the eponymous estate, who is also Paola Grasso’s husband. That gave me a chance not only to taste his sparkling, Pinot Noir-Nebbiolo blend, Rosé Brut, but subsequently his fine boned, minerally, delicately-scented, single-vineyard San Michele Roero Arneis as he gave me a bottle to take away and taste. I have since met Carlo a couple of times in London, with his importer, Liberty Wines, and tasted some of his other wines, including an interesting Favorita (Vermentino). The below are presented in the order tasted, including the Deltetto Rosé Brut. Made since 2008 and designed for consumption by the glass in trattorias, as an approachable Nebbiolo, aiming for freshness and less structure. Stainless steel fermentation, with 10-12 days total maceration time, including MLF. No oak. 14.5% ABV. €8 / bottle RRP in Italy. New cuvee from 2014, blending the young vines from 3 crus: Ferrere, Marcarini and Montersino. Aim for more moderate prices than full Barbaresco, for intermediate consumers on their Nebbiolo journey. €10 / bottle RRP in Italy. Single cru. Planted 1970, 1999, 2001, 2011. West and South-west-facing. 2.5Ha of the cru was inherited. Fruit was sold to the Produttori del Barbaresco until 1987. Since 1988 they have made and bottled the wine themselves. The Riserva is only made in the very best vintages, with 2011 the most recent. That was 15% whole bunch fermented with twice-daily punchdown, then a 35-day maceration with the cap submerged. Ageing was extensive – 3 years in old tonneaux then 1 year in ceramic barrels. This was, unfortunately, not available to taste though. 50% Pinot Noir, 50% Nebbiolo. Press maceration after overnight cooling of grapes, giving 4 hours total skin contact. 48 months on lees. 7 g/L dosage.